Flavor House, Inc. utilizes a HACCP program to ensure that all products manufactured by us are safe and wholesome. Flavor House has a long list of prerequisite programs in place in order to create a stable environment for production. Temperatures are closely monitored through our process to ensure our customers receive materials that they can count on. All Flavor House, Inc. products are biologically tested prior to shipment to give proof of shelf stability. 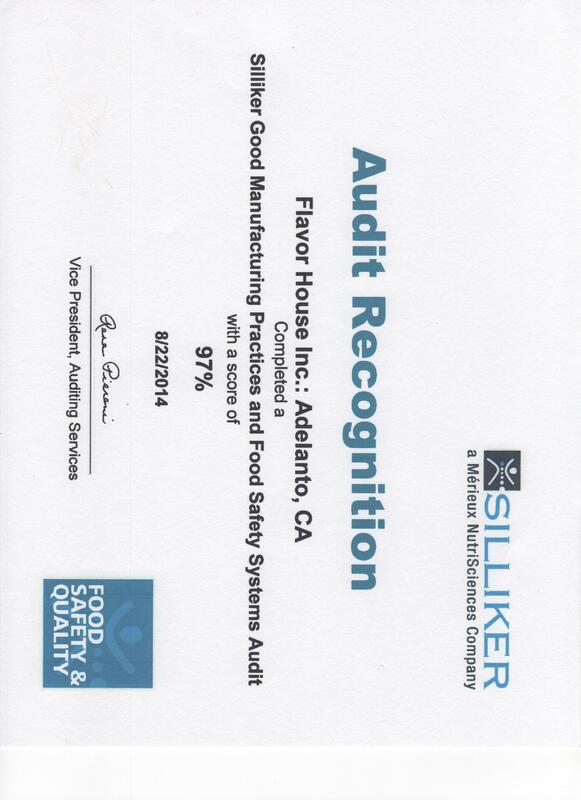 Flavor House, Inc. has been successfully audited by Silliker and received a score of 96.6%. For details of the audit please see the following link. Flavor House, Inc. prides itself on providing a consistent, high quality product. Through years of procedural development and training we have created a program for supplying dependable materials. All Flavor House, Inc. products are tested for TPC (total plate count), CEC (coliform & E.coli), and Salmonella. Monitoring is also done for Listeria and yeasts & molds. Special testing is available upon customer request (Staphylococcus Aureus, Bacillus Cereus, etc.). Flavor House provides free testing on all orders over 1000 pounds and orders of our standard “off the shelf” materials. Testing can be done by trained Flavor House Inc. staff or by an outside party if needed. Flavor House, Inc. has a detailed allergen program in place. Through exclusion and segregation our products only have the allergens that are listed on the label. Testing is performed whenever allergens are switched to provide assurance that there are no unlabeled allergens. Flavor House, Inc. recently opened its new 60,000 square foot warehouse on our 70 acre campus to enhance our existing 30,000 square foot production facility. We have plenty of room to grow as our customers needs require.